Da Capo Press, 9780306819674, 336pp. 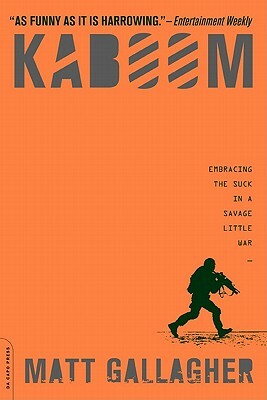 Based on Captain Matt Gallagher's controversial and popular blog, which the U.S. Army shut down in June 2008, Kaboom is a sardonic, unnerving, one-of-a-kind Iraq war memoir. "At turns hilarious, maddening and terrifying," providing "raw and insightful snapshots of conflict" (Washington Post), Kaboom resonates with stoical detachment from and timeless insight into a war that we are still trying to understand. Matt Gallagher joined the Army in 2005 and left in 2009 following a fifteen-month tour in Iraq. He is the author of the critically acclaimed novel, Youngblood. Originally from Reno, Nevada, he now lives in New York City.